What is involved in determining fault in an auto accident? The person who causes a car wreck because of negligence is usually the one to pay most of the costs for injuries and property damage, usually through his insurance company if he has insurance. Everyone who drives a vehicle on U.S. streets, roads and highways is bound to follow the many traffic and vehicle laws in place in the various states, cities and counties. If a person violates these laws and rules of the road and causes an accident, he will likely be liable to pay damages to any injured parties or survivors of those who died in the crash. The laws cover as many aspects of driving (and riding motorcycles) as possible, and nearly every state passes new traffic laws every year. The California Department of Motor Vehicles publishes a helpful, 116-page booklet titled The California Driver’s Handbook. It’s available in PDF online here, or you can pick one up at any DMV office. The book covers everything you need to know about driving safely and California laws regulating motoring on state roadways. 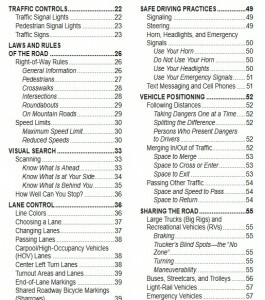 A screenshot of The California Driver’s Handbook showing some of the chapter headings concerning rules of the road. 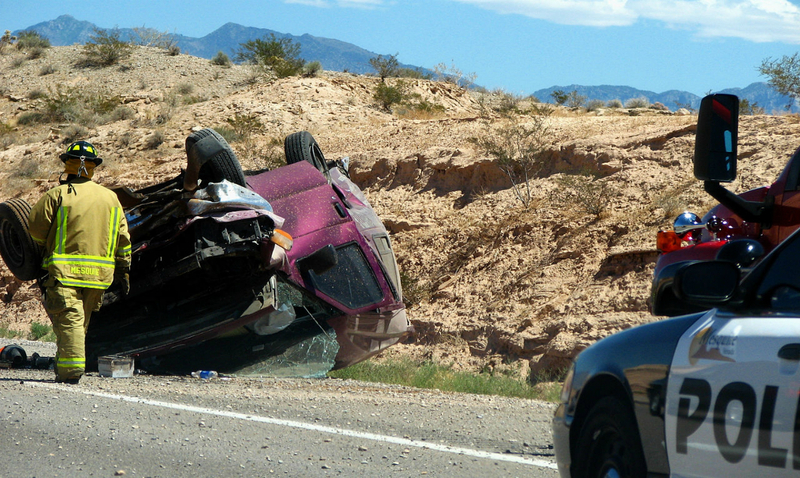 These laws are a guide for the authorities in determining how much liability a party has in an accident. If a person gets drunk and drives recklessly and causes a crash that injures or kills someone, he may be punished not just with a financial judgment in civil court but criminal penalties in circuit court. A drunken person who causes an accident will likely be apportioned 100 percent of the fault in any accident. But if a victim of an accident was partly at fault, he may be able to collect less money. This is a legal concept called comparative negligence, in which the legal system allocates fault to parties involved in accidents. Say Driver 1 is making a left turn but gets hit by Driver 2, who is going straight through the intersection but is speeding. Driver 1 should have yielded the right of way to Driver 2, so he is partly at fault. But Driver 2 should not have been speeding, so he is partly at fault. It is up the insurance companies or a jury to determine how to allocate the liability for this accident. If Driver 1 is 80 percent at fault, Driver 2 may collect only 80 percent of the damages. The laws cover much more than impaired driving. They cover safety equipment such as lights and the use of directional signals, positioning of cars on the road, how to pass, how to drive in the vicinity of pedestrians, when it’s safe to turn at an intersection or pass another vehicle and the signs and signals that the state erects to safely direct traffic. Under a concept called the “duty of reasonable care,” motorists must drive safely and always use caution. The driver, cyclist or pedestrian did not use reasonable care. The driver’s maneuvers and conduct on the road caused an accident that resulted in injuries or damage. The plaintiff was injured or hurt in some way because of the driver’s conduct. The driver’s duties of reasonable care include not speeding, being vigilant and watching out for pedestrians, vehicles and road hazards; keeping the car under control; maintaining the automobile in working order and using the safety equipment properly. Some conduct by drivers is so egregious that authorities presume he was negligent even before the case goes to court, and he must attempt to prove he was not at fault for an accident. This conduct includes driving while impaired by alcohol or drugs, violating a driver or pedestrian’s right of way, or operating a vehicle on the wrong side of the road. Do not leave the crash scene. Call the authorities and report the accident. Call for an ambulance if anyone is injured. Be polite at the scene but don’t apologize or admit any guilt. Get the names and phone numbers of the other drivers and also any witnesses. When you go home, contact your insurance company. Do not lie or you may be denied coverage if caught. Record all bills for doctors and other medical treatments and for damage to your car. We also published a blog on dealing with insurance adjusters and how they’re not your friend no matter how friendly they may seem. The San Bernardino auto-accident attorneys at Krasney Law can help you maneuver through the complicated world of auto insurance, legal ramifications and settlements. If you or anyone else in the accident is injured, the best course is to contact your Inland Empire auto-accident attorneys at Krasney Law, (909) 380-7200. We will charge you nothing for an initial consultation, and we may arrange payment on a contingency basis. That is, we don’t get paid unless you accept a settlement or we go to trial.